Women are beautiful, a piece of true art. They come in different shapes and sizes, each of their curves appear to have been perfectly formed by a master craftsman. There’s a certain elegance that one experiences when a woman walks into the room. iPods are beautiful, a piece of true art. They come in different shapes and sizes, each of their curves appear to have been perfectly formed by a master craftsman. There’s a certain elegance that one experiences when an iPod walks into the room (or is pulled out of a pocket). iPods, like women, cannot just waltz around the city naked. The thought of exposing such fragile artistry in today’s hazardous environment would be insane. Slappa knows this, and has produced a spiffy yet solid protective shield for iPod Mini’s everywhere. At first look the Shockshell case looks like a colorful piece of rubber wrapped around the iPod Mini. There’s much more to it than that! There are three layers to the Shockshell case. Inside is a smooth, soft cushion for your iPod to snuggle up against. In the middle is a tough aluminum core that provides a rigid form and ultimate protection. The outermost layer is a rubberized hypergrip that not only functions for protection but aesthetics as well. I like my women and iPods art to be naked exhibited as much as any other man. Without proper protection however, neither would be able to leave the house. 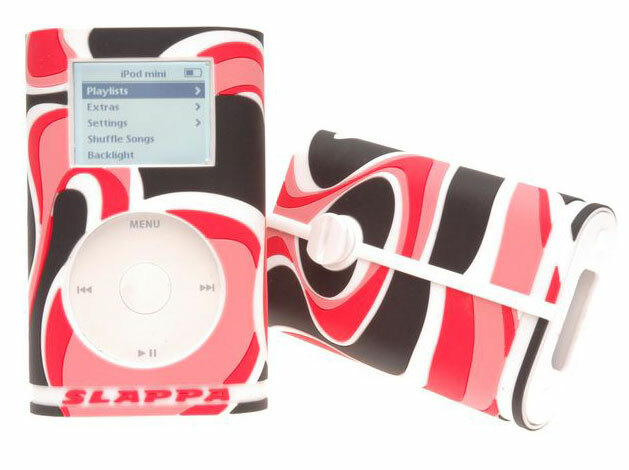 The Slappa Shockshell will solve any issues you have with the iPod Mini. As for women… Slappa does not make any cases that house actual women. This is a “Contest Post“, so leave a comment! I have another child who can’t decide if her favorite color is red or pink. Now she will not have to choose. I know a few women that wear less the the Slappa skins. JMA – no, there is no exchange. All editorial/content comes through separate of advertising/promotion. The guys at Slappa offered us the cases AFTER we posted the original content.